We love to promote events in Oregon and to help you find your next bike adventure! Please note – ORbike does not organize rides. Always verify event details with the event organizer before heading out for the day. ORGANIZERS: ORbike goes out to 50,000 regional cyclists. How are you promoting your event this season? Contact us! Join us at 10:30 on the second and fourth Mondays of the month January through March for stories (bike-related and more!) 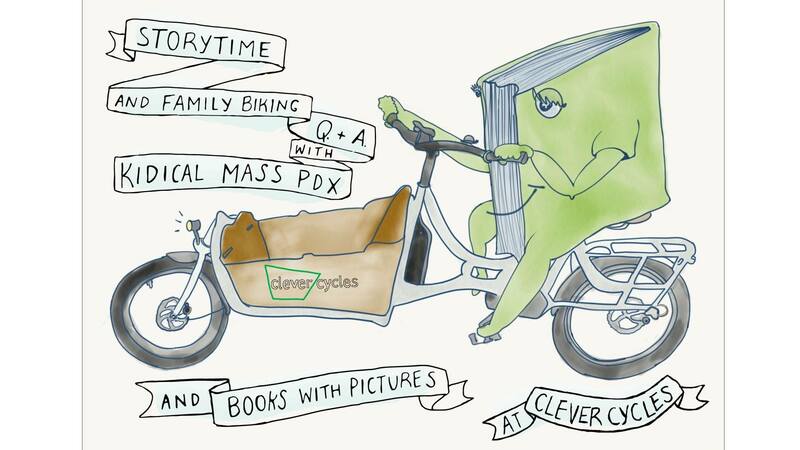 curated by Books with Pictures inclusive comics shop and read to you by Kidical Mass PDX biking parents. Stories will be read in the family-friendly bike shop’s comfy play area (and yes, the bathroom has a changing table!) and if you’d like to learn more about bicycling as a family, stick around for a Q&A session afterwards. If you fall in love with one of the books, many will be available for purchase on site (cash only), provided by Books with Pictures. What, you wanted a bike ride, too?! We’ll be biking the 3/4 of a mile along a family-friendly route (https://ridewithgps.com/routes/29134902) to Books with Pictures after each hour-long storytime/Q&A. Suitable for even the smallest riders. Come a little early to ask about borrowing a bike for the ride–Clever Cycles has a few bakfietsen and longtail kid-carrying cargo bikes to loan for families who want to join in on the fun. Drop us a line at any time to find out how we can help promote your event! If you have questions about an event, please contact the event directly. We do not host any events and cannot answer those questions.